We originally created our Appalachian Crafter's Hand Repair Soap for a mountain basketweaver, whose dry hands were nicked with cuts and sore at the end of each long day of crafting. No ointments or lotions could be used for protection or healing because her hands had to be perfectly clean to handle crafting materials the next day - any ointments or salves would be absorbed by the basket reeds and stain the natural materials. Since 1998, our Appalachian Crafters Hand Repair Soaps have become the hand soap of choice for all those with dry, cracked hands: knitters, quilters, artists, potters, and basketweavers in the Blue Ridge Mountains. But of course, you don't have to be an artisan to have dry hands or dry skin, or need a good, moisturizing hand soap. Whether you are a health care or food service professional who needs to wash your hands a hundred times a day, or a chemist, carpenter, or maintenance person who has to handle irritating materials and product residues, our Hand Repair Soaps will be just what you need. Over time as you use our Hand soaps, your skin's natural oil balance will be restored. 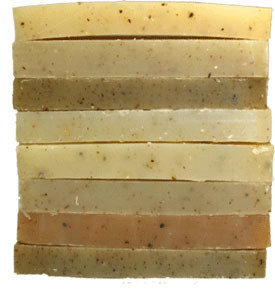 Our gentle recipe will not strip your skin of its natural glycerine like the grocery store soaps. The rich oils in our recipe will protect your pores each time you wash, preventing the water from continually stealing your skin's precious moisture. And the shea and cocoa butters will lubricate your dry skin, soften your dry skin areas, cuts, and cracks, and soothe the cracked and bleeding cuticles that often accompany severely dry hands. You may find you need to use less lotion, or perhaps none at all, as some of our customers have reported. The healing herbs added to our hand soap have been historically used to encourage small nicks and cuts to heal faster, and reduce soreness and irritation by keeping the skin that is healing soft and pliable. We make our Hand Soaps in a variety of scents described below, as well as an unscented version. Other Shea and Cocoa Butter Soaps without ground herbs can be found in our Shea Butter Facial Soap section, with additional fragrances not found in our Hand Soaps for dry cracked hands. Made with stoneground cornmeal grits, coffee grounds and pumice for extra efficiency in removing tough grime from hardworking hands. This shea butter hand repair soap is made with stoneground cornmeal grits for cleaning grime and oil from hands, and scented with Bay Rum. Our Bergamot Mint Hand Repair Soap is scented with 100% natural Bergamot Mint Essential Oil. Our Green Tea Hand Soap is a shea and cocoa butter soap with a light and fresh scent. Eight 1.5 ounce slices, one of our Shea and Cocoa Butter Hand Repair soap fragrances: Herbal, Bay Rum, Jasmine, Lavender, White Spice, Green Tea, Patchouli and Bergamot Mint. Three slices of our Shea and Cocoa Butter Hand Repair fragrances including Mountain Herb, Lavender, and Green Tea. Six full size bars in a tall Cellophane Bag, including Mountain Herb, Jasmine, Lavender, Green Tea, Bay Rum, and White Spice. A beautiful gift anytime of the year. Three bars of our luxurious hand repair soap recipe in our Jasmine, Herbal and Lavender scents, a nice mix of floral, woodsy, and herbal fragrances. Our Jasmine Hand Soap is made in our Shea and Cocoa Butter Hand Repair recipe, and is a light, realistic jasmine soap scent. Lavender Hand Repair Soap is our hand soap made with shea butter and cocoa butter recipe soap made with 100% natural Lavender Essential Oil. Our Mountain Herb Hand Repair soap is the first, and most popular, of our shea butter and cocoa butter hand soaps. This hand repair soap is made with stoneground cornmeal grits for removing grime and oil, and scented with tomato fragrance that smells like the vine, not the tomato. Our unscented Appalachian Crafters' Hand Repair soap for for moisturizing dry hands.